Import data downloaded with compatible clients into eMule. There are 2 kinds of import methods. eMule v0.30c introduced a convert function to import external partfiles to your eMule downloads. In this way you can resume downloads you started in other eD2k clients such as eDonkey, Shareaza, etc. 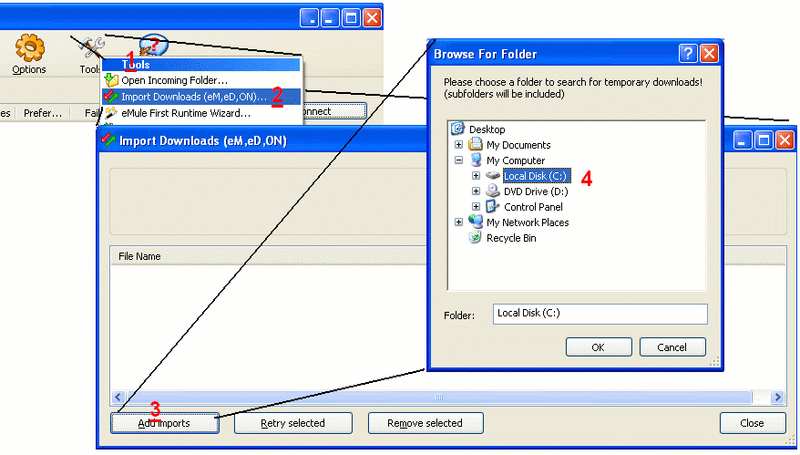 Another method to import file data is to add existing data to a currently running download. This method is especially useful in repairing corrupted download data, saving your eMule the time and effort it would take to re-download the data from network sources. BitTorrent users sometimes find themselves with unfinished downloads, and would like to complete them with eMule. Although there is no support in the official client for importing partially completed torrents, the third-party program dmTorrent2Part can use the data from .torrent files, and the ed2klink you found using eMule seach, to generate part.met and .part files. These files can then be imported into eMule. This page was last modified on 18 November 2010, at 14:49.